Samana , Vistamare. Spectacular Ocean & Beach Front Apartment. Open Floor Plan, 2 Bed/2 Ba, 3 Beds. Come to Enjoy and Relax this dream Paradise located in the prestiges Peninsula of Samana, Dominican Republic. Samana is a nature lovers spot all year round with some stunning beaches named top 10 most beautiful in the world. Explore the Dominican republic from the most authentic relax side. Samana is one of the most pristine areas of the Island and best kept secret of the Dominican republic. Samana has plenty of attractions to enjoy such as , Salto el Limon, Los Haitises national Park, Cayo Levantado, Las terrenas, Whale Watching (Season Jan-march)., Playa Rincon, Zip lines, Four track excursions , Horse back riding and much, much more!!!!. Vistamare, is located in los Naranjos in the Samana Peninsula, just 55 min from El Catey International Airport and 2 hours from santoDomingo International Airport. 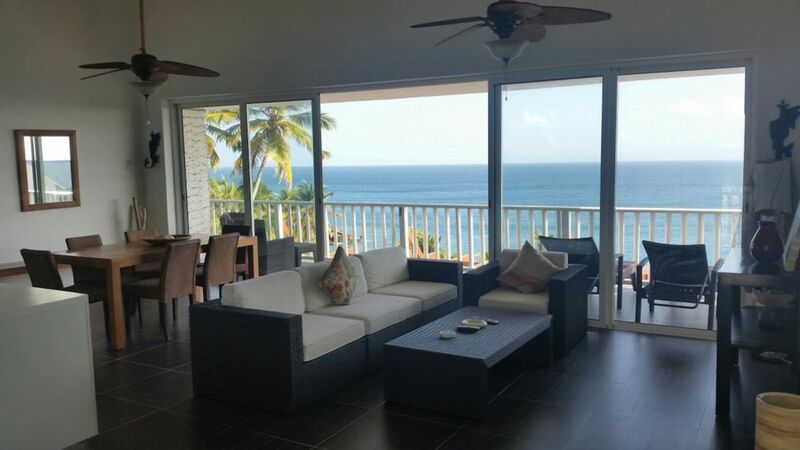 Considered one of the Most beautiful locations and panoramic views across Samana bay you will ever seen. Dreamlike private Beach in a Sheltered rocky cove with mesmerizing white surf. beautiful and modern apartment , amazing views, clean like a dream, excellent service and great tasting food . Very hard to describe so much beauty. The view sells this place! Astounding! High on a hill overlooking a sandy beach, crystal clear water, and whales performing towards the horizon backdrop of mountains! The two bedroom was clean and well-equipped and nicely laid out if a bit dated. The beds very comfortable. We kept the air conditioning on low in bedrooms with doors closed but the expanse of sliding doors in the living area wide open. Delightful breeze and temperatures. Morning sun on the deck until just afternoon for coffee and whale watching. Down to sunny beach below for afternoon of swimming, shelling, and sunning. Up to clubhouse for Pina Coladas and sunset. Restaurants in Las Galeras 15 minutes away for good, inexpensive food. One day of whale watching by boat arranged by Maria in reception. She was very friendly and helpful. Negatives would be; no microwave, more towels needed, living room couch uncomfortable, starter kit needed (laundry and dishwasher soaps), furniture in need of replacing, bathroom sink and faucet poor design (splashed), water spots on flooring, restaurant on premises very lacking but good service and Pina Coladas. We were here in early February and were surprised how few guests or owners were present. The whales made up for lack of fellow travelers. Jaime, thank you for the great review! We’re so happy you loved our place and can't wait to have you back at Vistamare .We are glad all went so smoothly. Would you mind sharing with your friends your great experience with us, We’d love to continue providing great service to awesome guest like you. Thanks again! Luxury apartment with the best view. Excellent property staff and great owners. Highly Recommended! My family of four spent a week at Ixia and Fernando's apartment at Vista Mare on the Samana peninsula. The apartment has all the amenities of a high end luxury home and plenty of space. The location within the property is what makes it extra special. It is a top corner apartment at the bottom left of the property so you have your own little corner of paradise to yourself. The apartment is only steps from the short path to the private beach where we spent most of our time. Ixia and Fernando communicated frequently throughout our stay and provided helpful tips about the area and things to do. The property staff at Vista Mare were all very helpful and many spoke English (which was very helpful given my limited Spanish). They responded quickly to one minor issue and provided a complimentary dinner for my family for the short disturbance to our vacation (we didn't really notice because we were on the beach the whole time!). Overall, I highly recommend this property and the owners for anyone visiting the area. We hope to return in the future. Jason, thank you so much for your kind words, it was truly an honor to have such a wonderful family staying in our place, the only thing I can think of , that with more people like you this would definitely be a better world. You are more than welcome to come any time you can, remember we have something pending between us, it has not been forgotten, some how will make it work. I highly recommend this great family as guests, !!!!!!! God Bless them. Great location with an awesome huge balcony overlooking the ocean. Thank you so much for your review, We are so glad you enjoyed our place and definitely more than welcome to have you as a guest again. Very comfortable home with an amazing view of the ocean. I would recommend this to anyone. The owners of this property are very hospitable and will make sure you have the best experience possible. Curtis, thank you very much for your review. It was a great having you in our place, you are more than welcome to come anytime!!. I hope we hear from you soon!! !